To move free disk space on Windows Server 2012, using AOMEI Partition Assistant Server Edition’s function: Allocate Free Space is the easiest the safest way. This article will tell you why. Why and how to move free disk space on Windows server 2012? Nowadays, popular server operating system is Windows Server 2012. However, “Low Disk Space” is a common disk space usage problem in Windows Server 2012 all editions, many people don’t know how to remove low disk space warning or fix this issue. In fact, it is easy, just move free disk space on Windows Server 2012 to fill the low space partition. Delete Temp Files on system. Shut down Windows update if possible. All above tips are temporary ways. You can change a bigger hard disk, but your server will be interrupted undoubtedly. Better solution is moving free disk space on Windows Server 2012 to expand the low space partition(partition C) with partition tool. Easy in theory, but hard to practice. Because Windows Server 2012 disk management has some limitations when using it. For example, if you want to expand C: partition with it, there must be an unallocated partition behind drive C. But there has no generally. To create an unallocated partition, you have to delete partition behind drive C, which is also unrealistic. We don’t allow data lose. So in this article, I want to give some hints maybe a “complete solution”. It would be great if there is a magic that can helps us move free disk space from secondary partition to system partition on Windows Server 2012. Thanks to the development of software industry, there are some third-party partition utilities now able to do this. 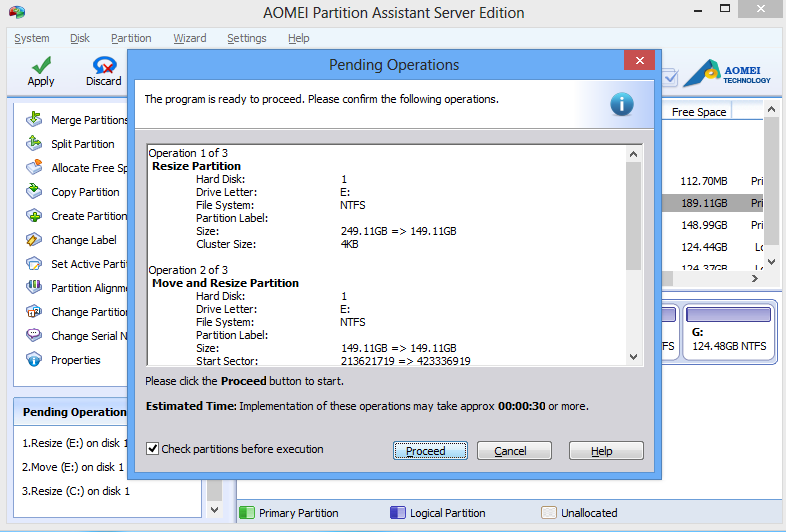 AOMEI Partition Assistant Server Edition is a well-known partition utility for hard drive partitioning. 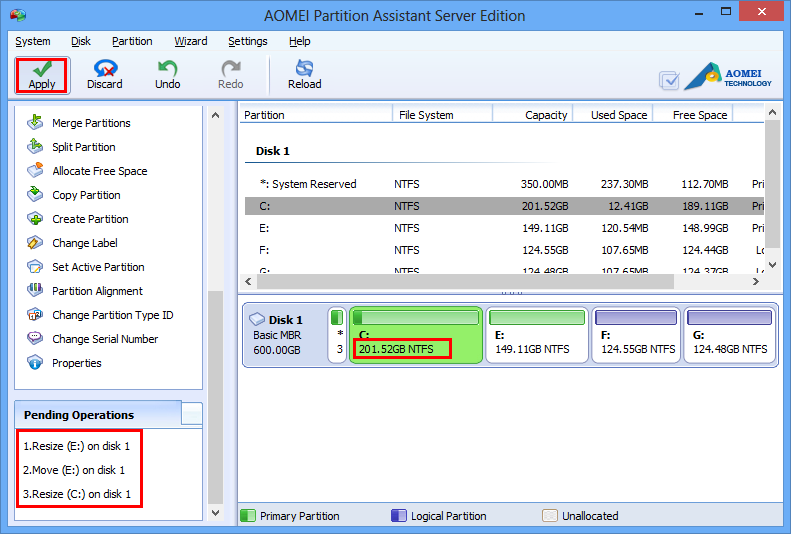 The easiest steps below displays how to move free space from E drive to system C drive on Windows Server 2012 by using AOMEI Partition Assistant Server Edition. First of all, you should download it from AOMEI official website. After installing, launch the program, you’ll see all detail information of the partition and disk in the main interface. Original size of partition C is 101.52GB in our test environment, our task is move 100GB (Or more) free space from E data partition to C system partition. Then, right click E drive and select “Allocate Free Space” option. In the pop-up window, type the free space value: 100GB, and select C: partition from the drop-down menu. Click “OK” to return to the main screen. You see, partition C has been changed to 201.52GB. There are three pending operations: resize E: drive, move E: drive, resize C: drive. 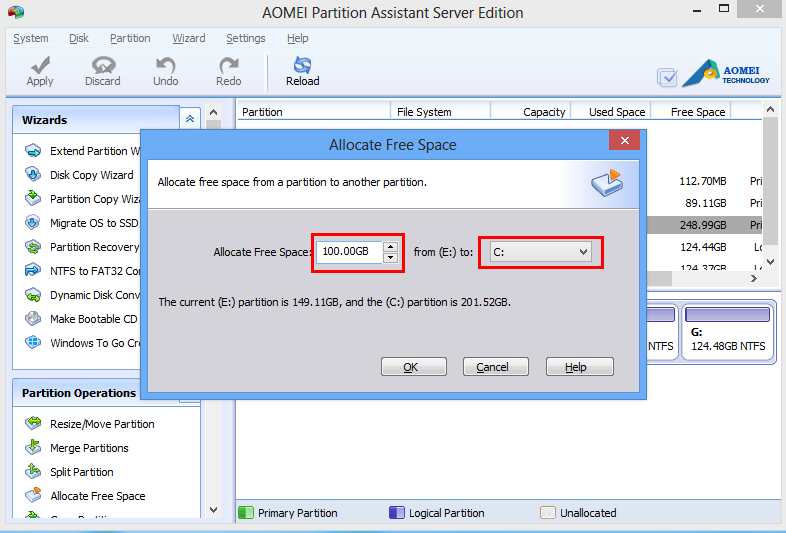 You may wonder whether we can shrink partition E then extend partition C using the free space? Yes, we can! Merge partition C with free space is also OK. But here I show is the simplest method, so “Allocate Free Space” is the first choice. Lastly, to perform the operations, you need to commit the changes by clicking “Apply” button. In the pop-up window, click “Proceed” if you are agree with the pending operations. Within minutes, the problem of low disk space on Windows Server 2012 has been solved. With the help of AOMEI Partition Assistant, you don’t need to reinstall system and reboot computer. Now you can install Windows updates, server services and applications all you want. The speed of your computer also will increase naturally. Now you see, AOMEI Partition Assistant is such a powerful third-party partition tool. The earlier you move free disk space on Windows Server 2012 with AOMEI Partition Assistant Server Edition, the more efficient you do business with Windows Server 2012.